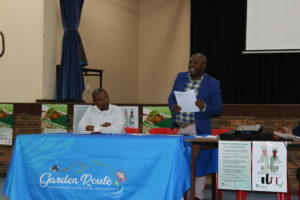 The Municipal Health team from the Garden Route District Municipality (GRDM), on Wednesday, 24 October 2018, surprised the learners and educators from the Hoogekraal Primary School near George, with a “different type” of health and hygiene training. 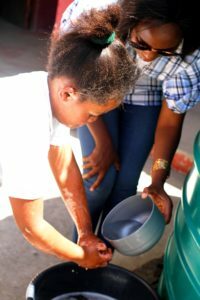 Juanita Samuels listens carefully and demonstrates to her fellow learners how hands must be properly washed. The drama group “Youth for Change” performing various plays to educate learners about the importance of good health and hygiene practises. 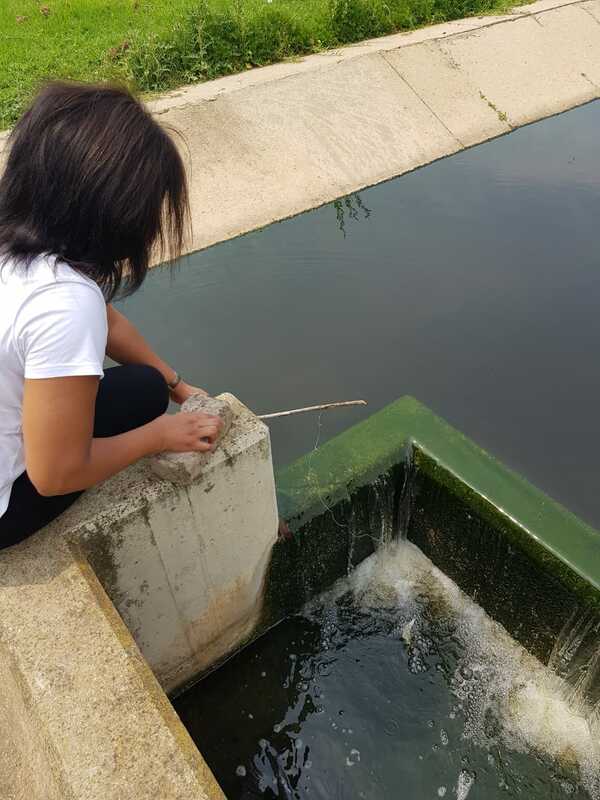 The group was formally trained by Garden Route District Municipality through a “Peer Educational Training Programme”. The learners looked confused when the team arrived, but soon a change in atmosphere took place when Ms Lana Don, Environmental Health Practitioner from the Municipal Health office in George led them with a song “Hands, shoulders, knees and toes” where after she opened the event with a prayer. The highlight of the event was when the “Youth for Change” drama group from Oudtshoorn performed various plays to convey messages relating to daily health and hygiene practises. In the play, the learners witnessed how their “Grandmother” passed away in front of them due to poor health practises and unhealthy eating habits. Seeing this happen, got some of them almost in tears. The young audience was not impressed with the bad and unhealthy lifestyle of their “Grandma” which ended up causing her death. Learners and educators of the Hoogekraal Primary School, with the Municipal Health team from Garden Route District Municipality and the “Youth for Change” drama group, soon after the health & hygiene formal programme. Ms Carike Jantjies, during her presentation to the learners focused on various aspects, such as the safe storing of food and the temperature in which food must be warmed up. “Food must be stored in a temperature of no less than 5oC and must be heated in a temperature of 60oC or more,” she emphasised. Ms Jantjies also enlightened the learners about Listeriosis, how it is borne and the dangers thereof. Environmental Health Practitioner, Ms Janine van Wyk, with colleagues Ms Ivy Mamegwa and Ms Sive Mkuta, demonstrated proper hand washing techniques to the learners. Ms van Wyk explained to the learners: “Do not only wash your hands, but also from the lower to the upper (middle) part of your arm”. Ms Van Wyk furthermore reiterated that, hands must be washed after playing or after lunch breaks and after using the toilet. Ms Emmy Douglas, GRDM Chief: Municipal Health at the GRDM George office, thanked the school principal, Mr Grootboom, for warmly welcoming the team on their arrival and allowing them to educate the learners in respect of good health & hygiene habits. She extended a special word of gratitude to the drama group and said: “You portrayed and conveyed the message to the learners in the best way possible, and we thank you”. 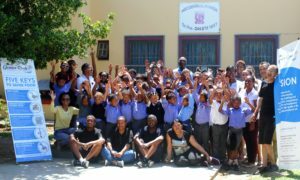 Mr Grootboom officially thanked the GRDM team and the drama group for making time and effort to reach out to the school. He said: “It clearly shows that Garden Route District Municipality did not forget about our school’s existence. 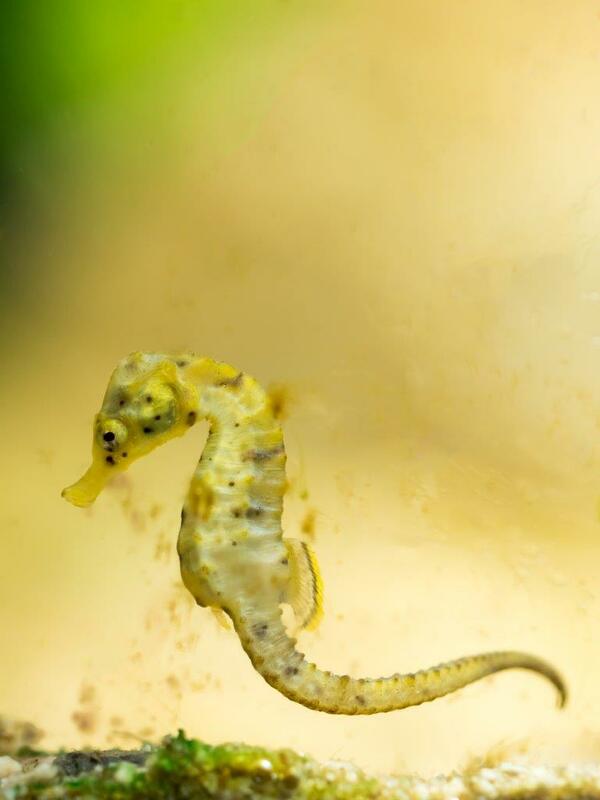 We truly appreciate this important outreach”. Mr Desmond Paulse, Manager: Municipal Health from the Oudtshoorn area, also attended the event. The informal food trading sector in South Africa has a positive impact on micro businesses which contributes to job creation, poverty alleviation and establishment of breadwinners in communities. The sector plays a critical role in food security, facilitating access to food by poor people living in urban areas and has the potential to expand the economic viability of the region. 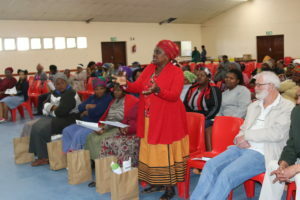 To address the Key Performance Areas set for Environmental Health Practitioners (EHPs), the EHPs of the Garden Route District Municipality’s (GRDM) Mossel Bay office, facilitated an awareness training session, focusing on informal food traders selling offal on 3 October 2018, at the Asla Park Community Hall. The aim of this type of training is to educate traders on basic food hygiene practices, as outlined in legislation and also to ensure that food being consumed does not pose health risks. The importance of safe, hygienic food handling and selling in the prevention of food poisoning outbreaks, are always emphasized during these events. The thirteen Informal Food Traders from KwaNonqaba and Asla Park in Mossel Bay, after the training session conducted by the GRDM Environmental Health Practitioners, Mr Lukanyo Mafuduka (left) and Ms Neo-Lay Britz (right). using safe water and safe raw material. 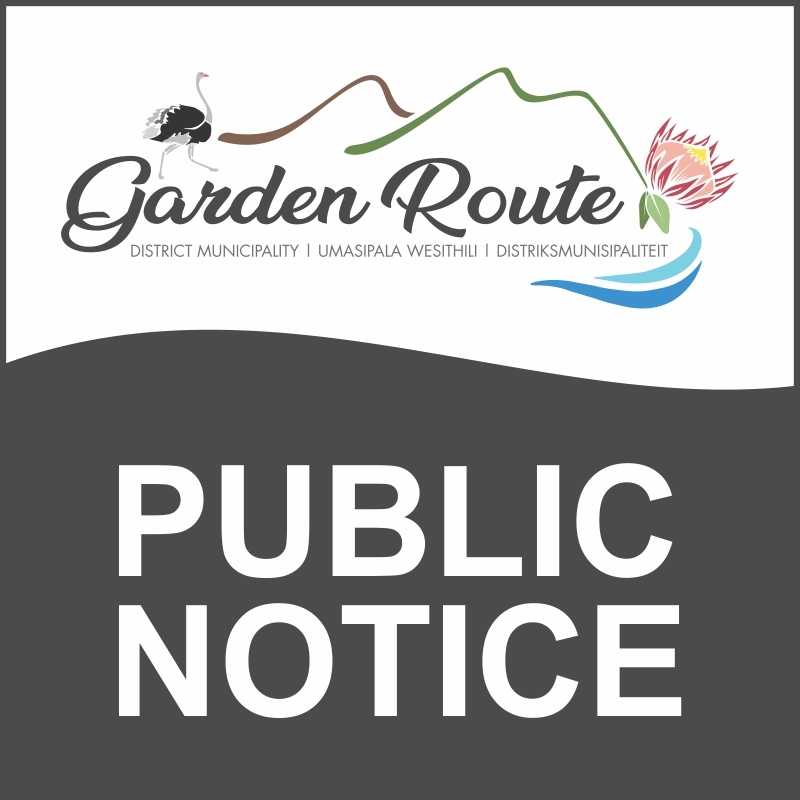 More training sessions will be conducted by the GRDM Environmental Health Practitioners throughout the year to ensure that safety and hygiene standards are met in order to protect the public. Statistics from the Department of Health showed, that many children and adults are suffering from diseases, such as diarrhoea, which can be easily prevented or cured, but sometimes result in very sad consequences. 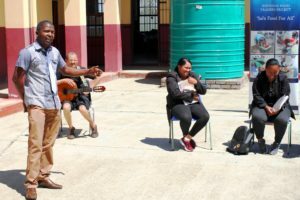 To address this problem, the Environmental Health Practitioners (EHPs) of the Garden Route District Municipality’s (GRDM) Klein Karoo municipal health office developed a drama production aimed at creating awareness among community members, especially school children. prevent the spread of diarrhoeal and other hygiene-, sanitation- and water related diseases in communities. A local actor and four (4) peer educators were approached to assist with the performance. The drama piece was also developed in commemoration of World Environmental Health Day, on 26 September 2018, themed – “Food Security and Sustainability”. 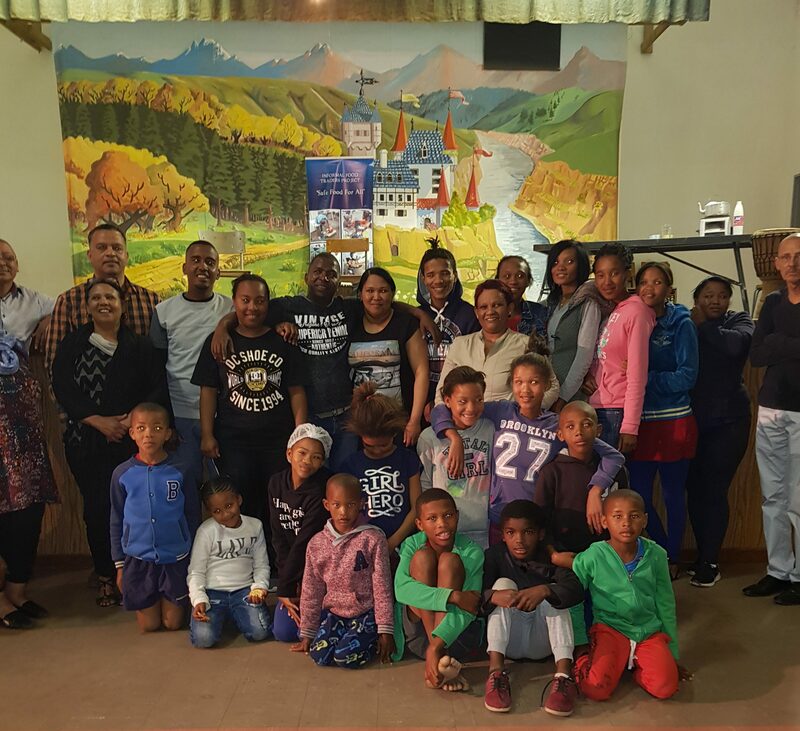 Actors and Environmental Health officials with some of the community members from Hoeko (Ladismith) who attended the information session. 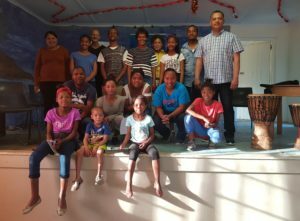 On 24 and 25 September 2018, the drama production was performed respectively in Hoeko (Ladismith area) and in Dysselsdorp. Approximately 216 households were reached through the initiative. Educators and community leaders were impressed by the informative messages that were conveyed. The actors demonstrated the relationship between good hygienic practices and health status towards a positive impact in community health and quality of life. According to the organisers of the events, the initiative surely increased the self-esteem of community members, promoted health and hygiene awareness practices and empowered the community with knowledge, in order to take responsibility for their own health and life. 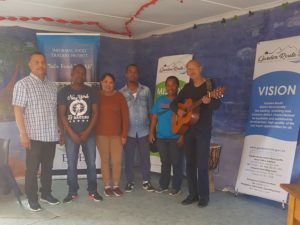 Mr Desmond Paulse, Manager Municipal Health: Klein Karoo (left) with the Peer Educators who performed in the drama production. The drama production forms part of an ongoing health and hygiene education programme performed by the GRDM municipal health section. A highly successful event was held at the Thembalethu Community Hall, on Wednesday, 26 September 2018, in commemoration of Wold Environmental Health Day (WEHD), initiated by the International Federation of Environmental Health. 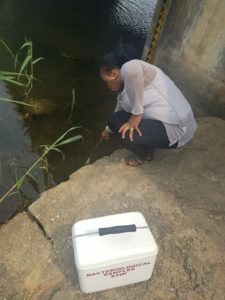 This year marks the 7th celebration of the event in South Africa, in recognition of the need to improve environmental health to protect human health. Cllr Khayalethu Lose, the Portfolio Chairperson of Community Services welcomed and thanked stakeholders for their attendance. The theme for 2018 is “Global Food Safety and Sustainability”, aimed to support the provision of safer food, for people to make use of the precious water and nutrient resources and for communities to increasingly value sustainable food production, distribution and consumption. After presentations, attendees were encouraged to ask questions and raised concerns. 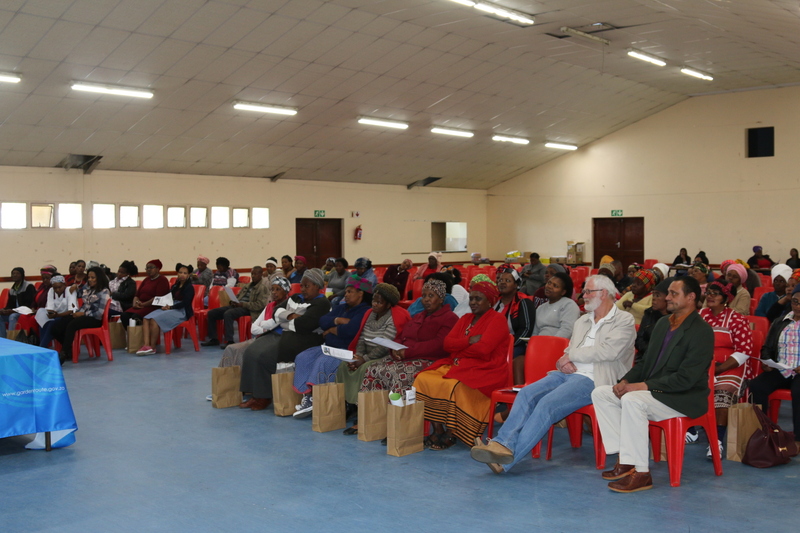 Approximately 80 people, consisting of informal and formal food and meat traders, small farmers, caterers, crèche cooks and community members, from Thembalethu, were present at the interactive information session. The objectives of the event were to educate, share and discuss the legal requirements in the food industry as well as major threats to food safety, in particularly the incorrect handling of foodstuff; climate change; anti-microbial resistance; antibiotics in meat; food wastage and access to safe water and chemicals. Mr Tony Dyers of the Veterinarian Service delivered an informative presentation on meat safety, followed by Dr Dyason of the Department of Agriculture, who shared facts about Rabies, the symptoms, causes, treatment and prevention of the disease in animals. The Environmental Health Practitioners (EHPs) of the George Municipal Health Office furthermore enlightened attendees on counterfeit foodstuffs; “best before” dates and the five keys to safer food. 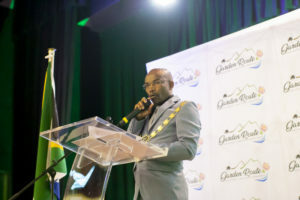 Similar celebrations were conducted in other areas within the Garden Route District, and according to the organisers of the event, the envisaged goals were achieved.